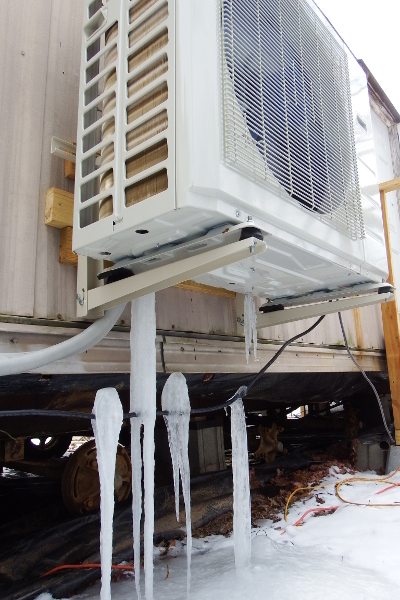 Well, we definitely can't report on the air-conditioning aspects yet, but I can give you a rundown on our minisplit's ability to keep our trailer warm. The really short version --- it works well until exterior temperatures get down into the single digits, but it's pretty pricey to operate. The image at the top of this post shows three months of energy usage from last winter (a slightly warmer climate, but not by much, heating primarily with a wood stove) and this winter (in which the minisplit went into operation partway through the first month on the graph). The lower energy usage for the third month of this year is because I had so much sticker shock at a $300 electric bill that I kept the interior temperature around 58 to 60 most of the time during January. Other than energy usage, I only have a few things to report about the minisplit. Mostly it just runs --- yay! We're extremely glad we mounted it on the wall rather than on a pad on the ground because the defrost function creates huge icicles below it during frigid weather. (The photo here is only the barest edge of what happened later in the month, which I thought I'd photographed but apparently hadn't.) I'm not sure how even a well-drained, ground-mounted unit could keep going in the face of so much ice. The thermostat on our particular unit is pretty terrible. The colder it gets outside, the less realistic the temperature we set on the unit is (as measured by a thermometer placed only a few feet away from the remote, which is where the minisplit measures air temperature). The settings also only go down to 62, which is a shame --- I'd really like a spot between that and off to use at night. In terms of sound --- the minisplit is remarkably quiet. Now and then when ice is building up on the blade, you'll hear it more than usual for a few minutes. But, usually, it's a very dull hum from inside the trailer --- non-noticeable. In the end, we're very glad we have an easy, moderately efficient electric option, but all electric heat sources are still energy- and money-intensive. We're looking forward to installing our wood stove before next winter, at which point I suspect we'll move to using the minisplit about half as much as we currently do. I would have "sticker shock" if I got a bill for $300 for electricity as well! Seems to me you might want to install a wood stove asap. I would think that after a year of living there you could get on bill averaging or what my power company calls budget billing, really smooths out the expensive months vs the cheap ones. Just wondering how you are able to break down the cost of your mini-split heat usage versus your hot water heater usage, since I think they are both electric. I think I read you also bought an efficient electric heat pump type of water heater as well and that it was quite loud and large, so you put it away from bedrooms. (Or am I just making this all up?? I've done that before. ;). I've read they are about 2/3 more efficient/cheaper to run than the conventional electric water heaters. If the above is true, just wondering what portion of the electric bill is for hot water. Thx kindly.